FLOYD MAYWEATHER SAYS says the UFC has made him a huge offer to return to combat sports. In a live Periscope video uploaded by FightHype.com, the 15-time world boxing champion told fans that he could “come back” to UFC, fight “in the Octagon,” and “do a three or four-fight deal and make $1 billion,” or £745 million. 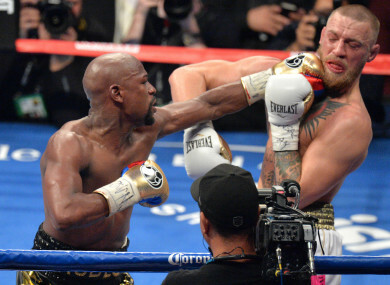 Mayweather beat UFC’s biggest star in August when he scored a technical knockout over Conor McGregor in a boxing ring. After the bout, McGregor lauded Mayweather’s skillset and said the American could excel in UFC. “He has some very strong tools he could bring into mixed martial arts for sure,” McGregor said. Email “Floyd Mayweather says UFC has offered him a fight deal that could be worth $1 billion”. Feedback on “Floyd Mayweather says UFC has offered him a fight deal that could be worth $1 billion”.